So about the bike. It (not SHE it’s inanimate!) 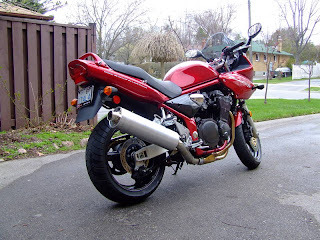 is a 2001 Suzuki Bandit GSF 1200S, it has 54000 or so Km’s on the odometer and I absolutely love it. It does not have a name. I don’t get the name thing. It’s not perfect. There are more comfortable, faster, more fuel efficient and possibly better looking bikes. But not by enough to make a difference to me. I’m just not skilled enough to hit these bikes limits. Someday maybe but not now maybe after I go to a race school. . The basics are this. Inline 4 Cylinder engine 1200cc’s (Ok 1157 sheesh!) DOHC, 16 valves, 485 lbs and it’s RED. I want to Mod a bunch of things but have not done everything I want to yet. I’ll be on a newer Bandit before I get everything done unless I win a lottery. Of course that brings up the question “If it’s so great why mod?” To which I answer because I can. If I had a Harley (No Chance but that’s a whole other topic) I’d be chroming it up like mad. Because that’s what Harley guys do. Ok that’s my impression but I do have some evidence. If I had a BMW I would be modding it, Honda likewise. And so on. It’s a customizing thing that every rider I know does. Different Seats ,different exhaust (YOSH RS1 installed last night within 20 minutes of it hitting my hot little hands) different windshields etc,etc. I can’t articulate what it is about being on this bike that gets me. Just getting on and out the driveway puts a smile on my face. A lot of life’s difficulties seem quite trivial when I’m moving. Being leaned over and focusing really makes me happy and glad I’m on the planet. I don’t always feel that way so it’s pretty important to me. Now almost any bike gives me some of that . Bikes are like that, riding is like that. But I’ve ridden quite a few bikes and none are quite what my Bandit is. My brother in law and a friend both have 1200 Bandits and neither one does it for me. The brother in laws is a first generation and I find it vibrates too much. My friend’s is a 2002 and it just didn’t fit, it should have but it didn’t. And that’s about it I suspect I’ll return to this again. And Again. I lied. There is no better looking bike than you my sweet. I swear. I only put that so the others wouldn't be jealous. You know how they are. Have you watched the incredible documentary series "Long Way Round," follows actors Ewan McGregor and Charley Boorman on a motorcycle trip around the world. The two friends travel through such places as Siberia, Kazakhstan, Mongolia, and Alaska, before finally ending their journey in New York. The filming was done by on board cameras and one ride along cameraman. My husband just bought me part two last weekend and I am looking forward to watching their next journey. Yes and I have the DVD's and the book :)As well as the Long way down DVD's . Love those guys. If you liked that check out Jupitors travels by Ted Simon.It's the book that inspired Ewan and Charlie.